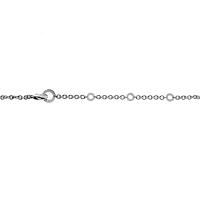 A fine Bulgari keepsake, this polished 18K white gold necklace is a wear-anywhere piece of jewelry. Alternating black onyx semi-precious spacer stones and polished Bulgari imprinted circles display the intricate yet contemporary luxury style of the Bulgari brand. 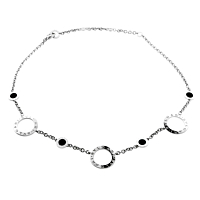 The white gold chain gives a sleek and professional but also flirty impression, and the contrast between the dark onyx stones and the gleam from the white gold create the perfect balance between fun and sophistication. Necklace Length Adjustable up to 19"